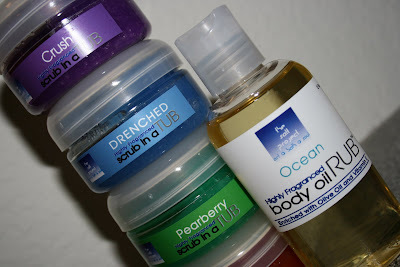 I have finally gotten back in stock my MOST favorite scrub and body oil. I HEART this stuff so much. "This stuff" refers to The Salt Project. I used these scrubs and body oil in the months leading up to my wedding and my skin was NEVER better. The greatest thing is that I don't have to use any lotion. I used to be such a lotion fiend but after I started using the Salt Project scrub and oil I found my skin was much softer and I didn't need the lotion. And now I'm going to admit something a little embarrassing. I am a suffering of adult acne. But not on my face. I get it on my back and chest. When I started using the scrub and oil it cleared all that up! Makes me love it all the more. And they smell SO delicious! My personal favorites are Crush, Drenched and Mango Tan. So what do you think of my new spectacles? Hubby: What? Those you have on? Wifey: Yea! These are my new ones. Hubby: Those aren't your old ones? Hubby: Oh, they look just like your old ones. 1.) I love books. I always have. I refer to them as my friends and refuse to give any of them away. 2.) I have fallen in love with cupcakes. Baking them. Decorating them. Figuring out way's to make them pretty. I never used to bake but I love to now. 3.) Ever since I got married I've become better friends with my mom. I'm not sure why but I just feel closer to her. 4.) I am obssessed with Flickr. And having people leave me comments on my pictures. 5.) I think celebrities are stupid. They do dumb things and complain about stupid crap. But I still won't stop reading People. 6.) I love to blog stalk. And never let people know that I have been there. 7.) I'm worried about the type of mother I will be. 8.) I've never quite gotten over how people treated me when I was 17. 9.) I love my job. LOVE, LOVE, LOVE it. But I'm afraid at some point I might have to let it go. 10.) I love MySpace. I love talking to people I haven't talked to in years. 1. Mamsita - No one makes me laugh more. 2. 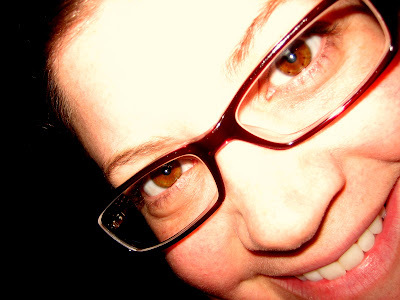 Jen(Memory Journalists) - Because I always love hearing what she has to say. 4. Mom - Because I love you! 5. Natalie - what greater time to write then now! 6. Aunt Steph - What's going on inside that head of yours? 7. Teresa - Because I would like to know more about you! It's one of those things. . . It's one of those things that you think will happen to someone else. It's one of those things that you hear about and think how sad, but it won't happen to me. 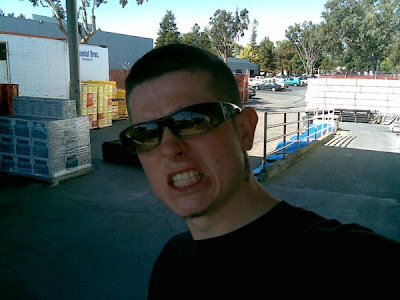 Randy Hammack, 24, died on Saturday, February 23rd at 5:20 AM in San Jose. He was a co-worker and a friend. This YOUNG man was funny, friendly, sweet, hard-working and so much more. I cannot imagine walking into our warehouse and not seeing him but I guess the choice isn't mine anymore. We will miss you Randy. She's wacky, she's cooky, she's the nice judge. Half the time she drives me nuts on AI but Paula Abdul reminds me of being a teenager and dancing around in my room with my secret tapes (yes TAPES). And just as before, she makes me want to shake my booty. 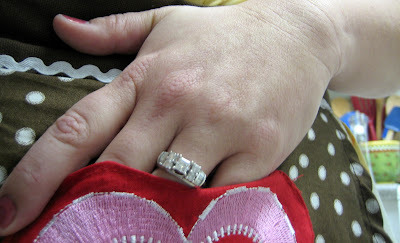 In my blog lurking tonight I came across many brave women that put it ALL out there. I mean ALL of it. We are talking affairs, depression, suicide attempts, divorce, trouble with their children, trouble being a mom, trouble being a wife. And I'm blown away. I wish I was that brave. I wish I was brave enough to release into the world the days that I was unhappy or unsatisfied or plain worn out. Oh, I do it in my own subtle way. But not like these women do. I salute you women bloggers of the world wide web and hope that I can be as brave as you someday soon. American Idol is back and THIS is one of the reasons I watch! Real life crazy. LOVE IT!!!! Now, I know I just did a bandwagon post but I have found a NEW NEW NEW website that I love! If you are reader this is the site for you! You can recommend books, check out what your friends are reading join book reading groups! SO COOL! Check it out! Well, it's been quite awhile but do I have a bandwagon product for you! I am such a beauty product-aholic. I own more beauty products then a person really should. And I will try all kinds of stuff if you tell me it is the latest and greatest. But this product I stumbled on only because I was broke and needed watch my pennies. 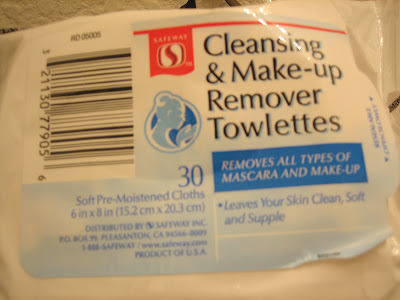 I always use some sort of make-up wipe to take off my make-up at the end of the day. I have used Ponds, Oil of Olay and even MAC. But the best one's I have ever used are made by Safeway. Yup. SAFEWAY! These are the absolute best. They take off the make-up so easily. I was really surprised! And CHEAP. Only about $4! Gotta love that! Remember that post I did awhile back about "The Man Cold". If you don't check it out again here. Anyway, foks we've got it and we've got it bad. I don't think I've ever heard anyone person utter so many times in 3 days, "Baby, I just feel so weak." You would think there were leeches all over his body sucking the very blood out of his veins. Poor man. He might die of the man cold. 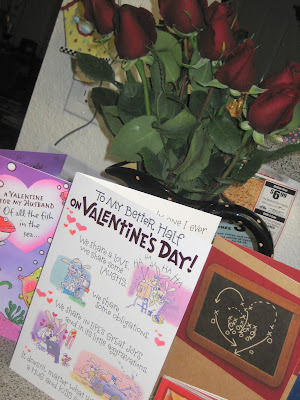 Well, it was our first marital Valentine's Day and it was a complete bust. We had decided to go to dinner at Black Angus and even actually went. 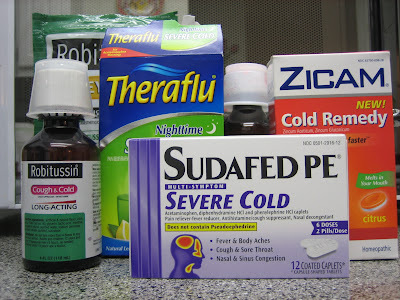 But about halfway through our meal Hubby got good and sick and back home we went. 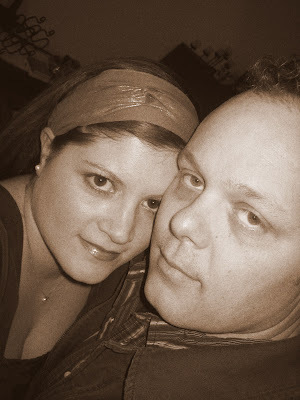 So I spent our very romantic evening sitting on the couch, watching Becoming Jane (which by the way was OK. 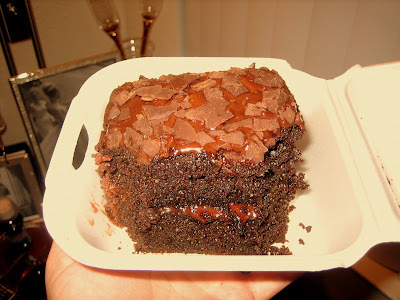 I was disappointed b/c I really like Anne Hathaway and I LOVE Jane Austen), drinking wine and eating yummy chocolate cake. Oh well! Guess we will have to be all gooey and romantic another night! That's Rachel Ray to you folks. 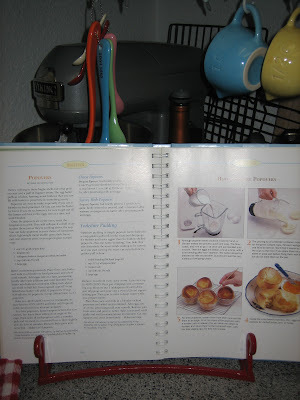 So I'm trying to gradual work my way through my Rachel Ray: 365 No Repeats cookbook. Everything I've cooked so far has been pretty yummy. 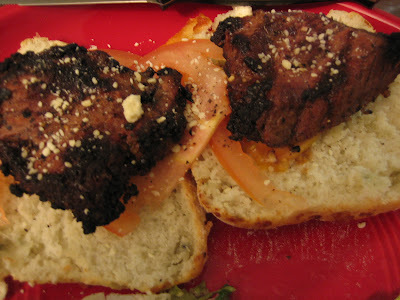 So the other night I tried another recipe and the hubby was very pleased with the result. Mix together the garlic, grill seasoning, Worcestershire sauce, salt, and pepper. Whisk in the extra-virgin olive oil. Pour into a glass dish or sealable plastic bag. Add the flank steak and coat it evenly in the marinade. Let it stand for 10 minutes. While the steak is marinating, prepare the biscuits. Place the biscuit mix in a bowl, add the blue cheese crumbles, and mix with a fork to distribute. Add water, according to the package directions. 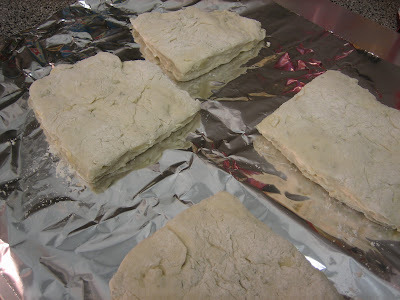 Once combined, dump the biscuit mix out on a cutting board (I added flour to the board before hand so it wouldn't stick). 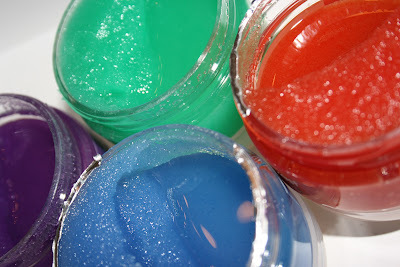 Using your fingertips, press out the mix into a 1-inch-thick square. Divide the square with a knife into 4 squares. Arrange the biscuits on a foil-lined cookie sheet and bake for 12 to 15 minutes, or until the biscuits are cooked through and the bottoms are golden brown. Remove from the oven and let cool. Grill the flank steak for 6 to 7 minutes on each side or to your preferred doneness. Remove the flank steak from the grill and let the juices redistribute before slicing. Thinly slice the tomato and coarsely chop the watercress; reserve. To serve, thinly slice the rested meat on an angle, cutting against the grain. 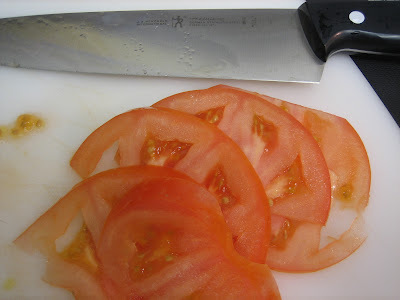 To make easy work of the slicing, use a sharp knife. Split each of the four biscuits in half. Arrange a slice or two of tomato on the bottom of each biscuit. Season the tomatoes with salt and pepper. Top the tomatoes with some of the sliced steak. Top that with a dollop of sour cream and a little of the chopped watercress. Set the biscuit top in place or slightly to the side. Eat up! First I didn't have any flank steak so I just used regular old steak. I also didn't use the watercress or sourcream. But it still tasted very yummy! So this boring day continues. And so does the baking. Courtesy of my pal Michelle. Cream butter, peanut butter & all sugars. Add egg, vanilla and mix well. 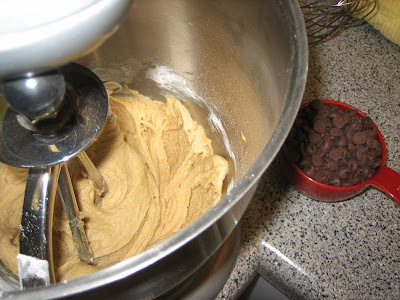 In a separate bowl, combine dry ingredients, then blend into the peanut butter mix. Shape into small balls (use your tablespoon), roll into sugar and place on cookie sheets. Flatten slightly with the bottom of a glass. 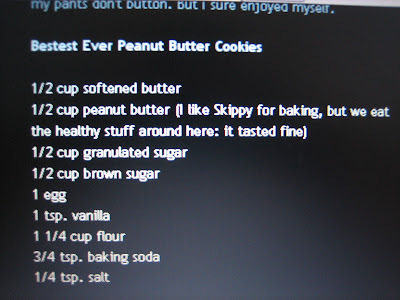 Bake approxiametly 10 minutes or until cookies are set. Do not let them turn brown. 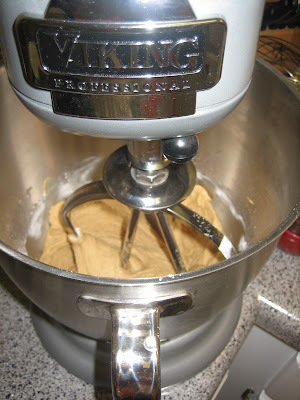 Yes, you may drool over my Viking blender. I screwed up a little bit when I made these. 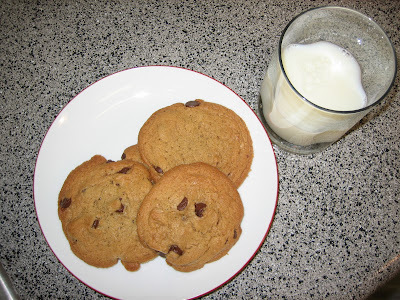 I made the cookies too big and I forgot to roll in the sugar. They were still freaking awesome though and I think Hubby might eat them ALL tonight! 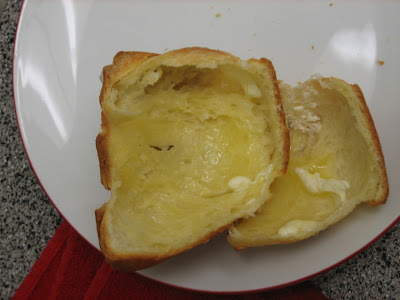 You can bake popovers in a metal muffin pan, a popover pan or ovenproof glass custard cups. DO NOT open your oven while the popovers are baking or they will collapse. 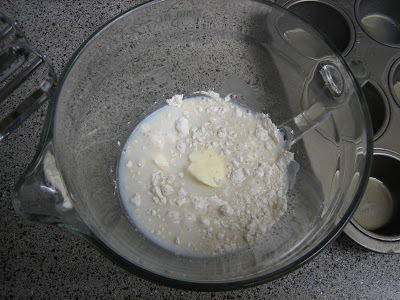 Place flour, salt, butter, and milk (you can use a mixer, blender or food processor) and whirl until smooth. Add eggs, one at a time, processing briefly after each addition just until blended. 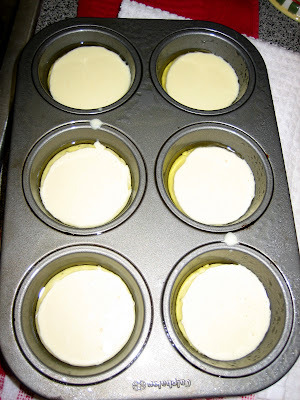 Pour batter into buttered containers, filling each about one third to half full. Bake in a 425 oven for 10 minutes. 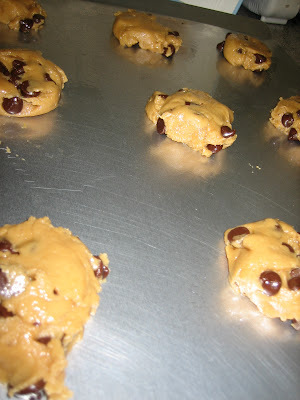 Reduce heat to 375 and bake until tops are richly browned, 20 to 30 minutes. 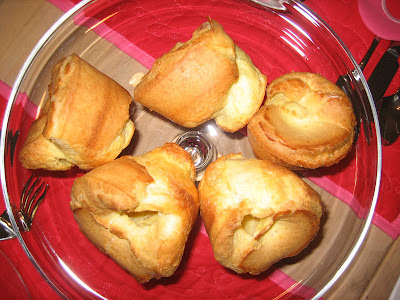 For drier popovers, loosen popovers from the containers, but leave them sitting at an angle in the cups. Prick the sides of each popover with a wooden pick and let stand in a turned-off oven with the door ajar. Serve warm with butter, jam or honey. I think this is so cool. We could all use more hugs. There are NO WORDS. . . . Thank you Memory Journalists, specifically Jen, Theresa and Kelly for capturing every single moment of our day!! !